Application of Udyog Aadhaar is mandatory for all entities working as MSMEs, without Udyog Aadhaar no entity shall be eligible for availing benefits introduced by the government for MSMEs. Registration of UDYOG Aadhaar is entirely an online process. On completion of registration, a unique 12 digit identification number is issued to the owner as a legal identity proof of business by the government. In spite of easy registration, unlike GST license cancellation or cancellation of any other registration, there is no particular procedure defined for cancellation or surrender of Udyog Aadhaar memorandum. Thus, MSMEs getting into the process of closure of business have to get their Udyog Aadhaar canceled through an off-line process. – To avoid its misuse by any other person/entity not eligible to avail any benefits under any scheme. – To avoid misrepresentation of any person through such registration in any institution. – To avoid penalties imposed by the government on misuse or forged actions initiated using such registrations. How to Cancel Udyog Aadhaar offline? Step 1: Locating a Udyog Aadhaar Registration Center: To apply for cancellation of Udyog Aadhaar one has to find the nearest located Udyog Aadhaar center. Generally, there are a number of Udyog Aadhaar centers located in every state. To check the nearest Udyog Aadhaar center click here. Step 2: Application for cancellation: Submit an application stating details of business and reason for the cancellation of registration to the respective judicial officer. Step 3: Submission of documents and declarations: While no specific document is required to apply for the cancellation of Udyog Aadhaar registration, one has to ensure that following documents are carried along to the judicial officer including the application of cancellation, declaration by an applicant, bank details of the business. Step 4: Receipt of acknowledgment: On proceeding and receipt of an application, the judicial officer shall issue a receipt of the acknowledgment of cancellation, which can be used for future references. After the cancellation of Udyog Registration, no business activity shall have to be conducted; also no bank accounts should be operated in the name of the business. Ensure that there is sufficient reason to place before the officer in charge for cancellation, and the business should not be an ailment of any government scheme, offer or liabilities made in name of registration. In case there are minute corrections in registration, then one does not have to apply for cancellation and have to get it rectified through the official web portal of Udyog Aadhaar. Need assistance on MSME registration? TaxReturnWala serves you the most trusted business incorporation solutions online. We help you get your business to be on the right track through effective business registration as MSME, guiding you on all MSME compliances – filling trademark applications, applying small business loans and schemes of government for MSMEs. 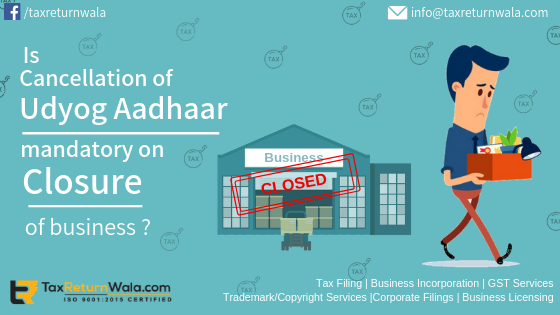 Place your concern at info@taxreturnwala.com.